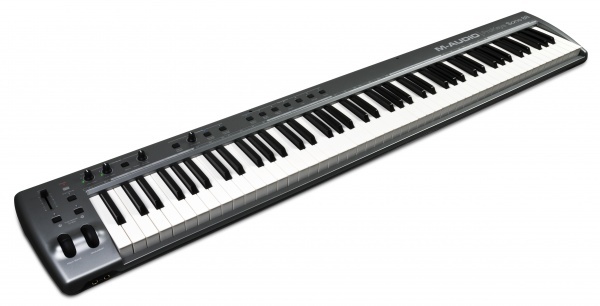 The ProKeys 88 is the premium digital stage piano that doubles as a great MIDI controller. It's loaded with large, realistic samples—14 world-class instruments in all, including split/layer capabilities. We paired those great sounds with an 88-key graded hammer-action keyboard, delivering a realistic feel to satisfy the most demanding pro. The ProKeys 88 is also a great master controller keyboard, including a built-in USB MIDI interface for easy direct connection to your PC or Mac, MIDI In and Out jacks to communicate with other MIDI gear, pitch and modulation wheels, sequencer controls and more. ProKeys 88 pulls out all the stops in creating the ultimate playing experience in an affordable digital stage piano. Ultra-Realistic Piano:Our goal in designing the ProKeys 88 was to create an extremely musical and realistic piano experience. The caliber of a digital piano is greatly influenced by the quality and the size of the samples, so we started by giving the ProKeys 88 a generous amount of memory. Then, rather than dividing it up amongst a bunch of sounds you're not likely to use, we focused on the 14 sounds that are the bread and butter for many keyboardists—paying special attention to the stereo grand piano.